GAO-15-419: Published: May 12, 2015. Publicly Released: Jun 2, 2015. 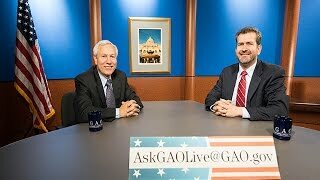 Online video chat with Charles Jeszeck, Director, Education, Workforce, and Income Security. Many retirees and workers approaching retirement have limited financial resources. About half of households age 55 and older have no retirement savings (such as in a 401(k) plan or an IRA). According to GAO's analysis of the 2013 Survey of Consumer Finances, many older households without retirement savings have few other resources, such as a defined benefit (DB) plan or nonretirement savings, to draw on in retirement (see figure below). For example, among households age 55 and older, about 29 percent have neither retirement savings nor a DB plan, which typically provides a monthly payment for life. Households that have retirement savings generally have other resources to draw on, such as non-retirement savings and DB plans. Among those with some retirement savings, the median amount of those savings is about $104,000 for households age 55-64 and $148,000 for households age 65-74, equivalent to an inflation-protected annuity of $310 and $649 per month, respectively. Social Security provides most of the income for about half of households age 65 and older. Studies and surveys GAO reviewed provide mixed evidence about the adequacy of retirement savings. Studies range widely in their conclusions about the degree to which Americans are likely to maintain their pre-retirement standard of living in retirement, largely because of different assumptions about how much income this goal requires. The studies generally found about one-third to two-thirds of workers are at risk of falling short of this target. In surveys, compared to current retirees, workers age 55 and older expect to retire later and a higher percentage plan to work during retirement. However, one survey found that about half of retirees said they retired earlier than planned due to health problems, changes at their workplace, or other factors, suggesting that many workers may be overestimating their future retirement income and savings. Surveys have also found that people age 55-64 are less confident about their finances in retirement than those who are age 65 or older. As baby boomers move into retirement each year, the Census Bureau projects that the age 65-and-older population will grow over 50 percent between 2015 and 2030. Several issues call attention to the retirement security of this sizeable population, including a shift in private-sector pension coverage from defined benefit plans to defined contribution plans, longer life expectancies, and uncertainty about Social Security's long-term financial condition. In light of these developments, GAO was asked to review the financial status of workers approaching retirement and of current retirees. GAO examined 1) the financial resources of workers approaching retirement and retirees and 2) the evidence that studies and surveys provide about retirement security for workers and retirees. To conduct this work, GAO analyzed household financial data, including retirement savings and income, from the Federal Reserve's 2013 Survey of Consumer Finances, reviewed academic studies of retirement savings adequacy, analyzed retirement-related questions from surveys, and interviewed retirement experts about retirement readiness. GAO found the data to be reliable for the purposes used in this report. GAO received technical comments on a draft of this report from the Department of Labor and incorporated them as appropriate. For more information, contact Charles A. Jeszeck at (202) 512-7215 or jeszeckc@gao.gov.